We all have lessons that just don't work out. Sometimes we expect too much, sometimes or materials don't work, and sometimes we just have an off day. 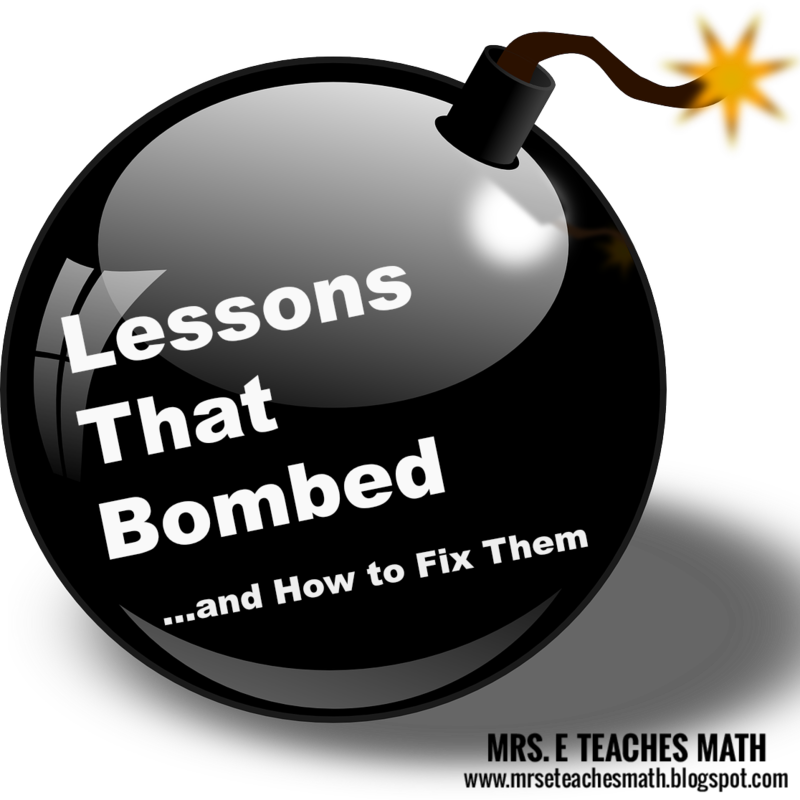 There are tons of reasons a lesson can "bomb". I asked around and lots of teachers shared a lesson of theirs that was less than stellar, and how they fixed it. The first year with a new curriculum we were to assign 3rd graders a 7 week research project of how technology in various areas have improved human need. We struggled and turned to TpT to find graphic organizers and planning pages. We ended up taking 9 weeks instead of 7 and consolidated the topics the next year. The first time I taught Geometry proofs, I followed the textbook to introduce the concept of two-column proofs. It included a few Algebra proofs, but they were the typical Algebra proofs in which you just solve an equation and justify each step. My students really struggled when we got into the Geometry proofs. The first Geometry proof lesson was really rough. The kids complained that it made no sense at all. I realized that the main source of their confusion was the Transitive Property and Substitution. I actually went back and re-did the entire introduction to proofs and created a whole new breed of Algebra proof to break this process into bite-sized pieces. The kids got comfortable with manipulating and combining the steps within their proofs BEFORE having to work with a diagram or new Geometry concepts. It made a huge difference, and I was then able to perfect my proof unit for the next class. Now, this is my favorite lesson to teach. Read more about it here. For one of my teacher evaluations I had an exciting lab planned. I found a bunch of elodea (an aquatic fish tank plant) on ebay at a much cheaper price than the local pet stores. Score! So I ordered a bunch of it, and it came in the mail the day before my evaluation. I live in Phoenix, where the inside of a metal mailbox can reach temperatures of... well lets just say really stinking hot! As I walked to the mailbox after school, I could smell a rotten fishy smell from 50 feet away. I was near tears as I opened my rotten package. After scrambling to 3 pet stores that evening, I luckily found enough to make it through my evaluation the next day. Lesson learned- don't order things on ebay when it comes to teacher evaluations! My first year teaching, I had the hilarious experience of once trying to teach the same lesson plan to a class for a second day in a row. I had four sections criss-crossing across the weekly schedule and just got mixed up. I had been teaching it for about 10 minutes when one of my students said, "Um? I think we did this yesterday? I mean, we liked it..." It was the first time I ever had to make up a lesson plan on my feet, and it was actually pretty freeing. Once I realized I could make up 40 minutes of activities from scratch with all my students watching, I felt less stressed about having everything prepared down to the second. I had a scheduled observation coming up and decided to teach a lesson using the SmartBoard I had recently received for my classroom. Using a SmartBoard was new for me and I wanted to get feedback on how I was doing with it so I taught a lesson that was completely new. I had a pretty good relationship with my supervisor so I wasn't afraid of taking the risk during an observation whose purpose was to evaluate my teaching ability. Well, that might not have been the smartest thing to do! While not a complete disaster, the lesson did not go well at all. It was a fifth grade ESL Social Studies class and I was trying to teach about Native American cultures and regions. About halfway through the period, it was becoming increasingly clear that the kids did not understand what was going on. Nevertheless, I kept going. The post-observation conference was actually very helpful. She gave me several suggestions not only for how I could have better designed the lesson to begin with but also how I could have salvaged it once I realized it wasn't going well. She also gave me some recommendations for future lessons. For my lesson with that class the next day, I completely redid my lesson plan and instead retaught the concepts the kids were confused about. When my supervisor came to observe me the next time, I made sure I incorporated her recommendations into my lesson. Her write-up of that observation indicated her satisfaction about that and the feedback was much more complimentary. What I also learned was that if a lesson isn't going well, even if someone is observing you and is expecting to see something in particular (because it was discussed in advance), don't be afraid to change course partway through the lesson. It's better to stop and regroup than to mindlessly continue doing something that isn't helping students learn. The purpose of a lesson is to provide instruction in a comprehensible way and if that's not happening for the students, then it's better to change what you're doing. If you sense that something isn't going well, don't wait for someone else to confirm that! Go with your instinct--teachers have to make decisions on the fly all the time and even if it's during an observation by your supervisor, don't be afraid to make a decision during that time, either. This product can help teachers figure out how they feel about various aspects of teaching, including professional development. In my first year (Back before Pinterest, TpT, and common core), I had an objective about text features. There was no exemplars of what the text features were or suggestions of how to teach the lesson. The lesson itself was a failure because I wasn't clear on the objectives or the methods that would have my students understand the features. Even worse, it was the day my principal and a consultant chose to observe me. Afterwards, my principal and I came up with a plan to help me improve my lesson planning. 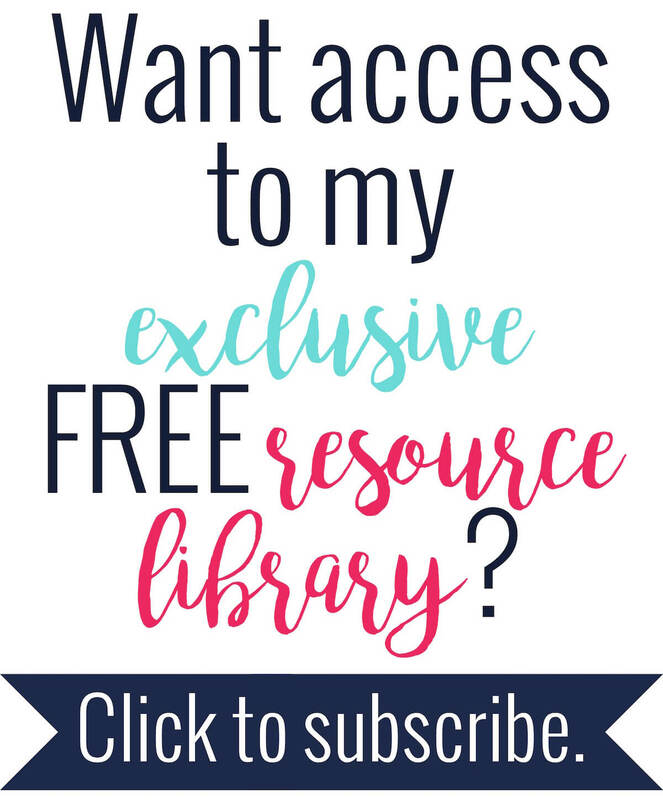 I think it was a huge growth moment because I needed help and I had to humble myself to get the help I needed to develop myself as a teacher. It was a tough but very necessary lesson. Every year when I try to teach inverse functions in Algebra 2 and Precalculus, it doesn't resonate with students what inverses are, how they look on a graph, how to find an inverse given a function, or what happens when they are composed. The only thing I can get them to remember is that the domain and range switch. I've even tried breaking the lesson up into two days, but the results are the same....they look at me like I just taught them math in a foreign language and honestly, sometimes I feel like I have because I know I haven't found a good way to teach it. This year I tried something completely different by having them do a discovery lesson on inverses that they could work on with a partner. I was very nervous to try this method with such a difficult topic, but I thought what the heck, I'm going for it. I was pleasantly surprised how well they did with it, and they rocked the quiz that was given a few days later. I even had one student come in "bragging" that she taught two other students how to do inverses. What?!?! A student is doing the teaching.....I couldn't ask for anything more. I find so much value in students effectively communicating math with each other. The students were definitely overwhelmed at first, but the end result showed they learned the material with minimal help from me and were able to prove they retained the information. I'm sure there are many more great methods, but I'm just happy I found one that finally worked well for my students. This isn't so much as a bomb as a failure to get kids to listen. I was getting really tired of having to reteach lessons on paragraph structure, embedding and citing quotations, etc. My students were given lessons and handouts but they would never dig through their binders to find them. So I created my English Student's Guidebook, an easy to use flip book that they can use as a quick reference. A new principal, who wasn't familiar with me or my teaching, did an unannounced observation. Unfortunately, it was one of those days where everyone was working independently on a worksheet. There was no cooperative groups or differentiation that could be seen...and we know how they LOVE both of these! Fortunately, I had a planned observation coming up, so I decided to create task cards on a variety of different objectives and assigned students to groups based on the area that they needed to work on (one group worked on point of view, one group did Common Core Vocab, and another did text structure). Of course, it could be set up any way the teacher felt worked best, but for observation purposes, this is how I did it that day. Although they're called "End of Year Test Prep Task Cards," they could be used at any point. I was teaching factoring quadratics. I thought I would make it kinesthetic with number and variable cards. Previously, my students had used similar cards to factor. The lesson had gone great, so I thought I would use the same principles. Unfortunately, it was a disaster! The students could factor the different parts of the quadratic, but making the connection to the next steps were just not there. There was a lot of frustration on my students' part and mine. I don't know why I hadn't seen it. So, we scrapped it (fortunately it was just one center) and used other centers that day. The next day, I tried again with a completely different method I had seen using boxes, and it really clicked. While the second lesson wasn't as kinesthetic as the first one, the students still learned the concept and were actively engaged. Bad lessons happen, and sometimes I just can't foresee them. Still, it's what you learn out of it that makes you a better teacher. I was teaching a brand new speech class. The school was unhappy with the old curriculum and told me to, "make it better." One class I was setting up my Crowdrise project. I was REALLY excited. It was going to involve infographics, presentations, videos, and more! Students would be making a difference in the REAL WORLD, not just my classroom. However, once we started I realized that students had no clue how to take into account audience. Once I realized that I divided the project up in a very chunky manner. They finished the first infographic and then we switched to a different project. I put the first one on hold and we spent about two weeks just focusing on an Audience Project (The Shirt Day Project). Once that project finished, their grasp of speaking to different audiences had MASSIVELY improved, and they were ready to go to the project we put on pause. I don't ever think there's a problem with pausing a project or book to work on something else if you realize your students need more help in that area. Did you ever have a lesson that totally fell flat?